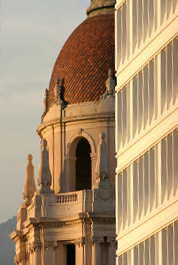 The Gooden Center’s residential treatment center is located in Pasadena, California. Nestled in the foothills of the San Gabriel Mountains and less than ten minutes from downtown Los Angeles, Pasadena offers an incredibly rich and diverse environment in which to attend treatment. Patients benefit from easy access to mountain wilderness, world-class colleges and universities, ski resorts, Old Town Pasadena, downtown Los Angeles, Hollywood, and the Pacific Ocean. This melting pot of culture and business provides patients with ample job, entertainment, and relaxation opportunities. Few residential treatment facilities in the world are set in the midst of so much natural, social and cultural diversity. The Gooden Center provides treatment in quiet, historic neighborhoods, on tree lined streets, and in homes that provide a feeling of comfort and warmth. Each location is held to the highest of historical and stylistic standards to insure a home-like atmosphere for each resident.